iSesamo makes opening electronics simple. This must-have tool for repair pros and DIYers is a thin, flexible and resilient steel blade that easily slides between panes of the most common electronic devices to pop them open in an instant. 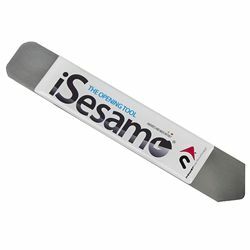 Whether you're changing a battery, a display LCD, touch screen or internal components, iSesamo makes accessing those components quick and painless. It's perfect for iPod®, iPhone®, iPad®, BlackBerry® and many other devices. Please note, exercise extreme care as permanent damage can result from excessive force, jarring or scraping. This tool can scratch metal or glass. Devices shown not included.